Congratulations! You’re newly married and all is blissful. You’ve tied the knot and enjoyed a whirlwind honeymoon, and now it’s time to get down to business: your financial and tax situation as a newly married couple. Some things have changed in how you’ll deal with your taxes, so here are a few tips to help you on your way. Sometime shortly after your marriage is official, you and your spouse should both sit down and go over your entire financial situation together. Examine your current incomes, what sort of combined debt you and your spouse now have, and how each of you is contributing to your retirement plans. By doing this together, you ensure that neither one of you is in the dark concerning your joint financial situation. This will help you significantly when it comes time to examine your taxes and file your return. Remember that W-4 you filled out when you first started your job? The one where you mark down yourself as single? Well, you should reexamine your W-4, because you are going to need to decide if you continue withholding at the single rate or wish to change that status. Of course, this depends on your joint income, but it’s something that you need to look into in order to make sure you withhold enough throughout the year. Talk this over with a tax professional for more help or take advantage of the free withholding calculators available on the internet. 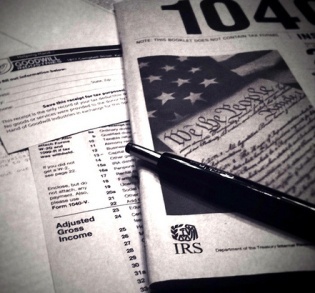 You’ll also want to consider filing a joint income tax return, as this will, according to the IRS, possibly lower your combined tax when compared to other filing statuses, and it could also increase your deductions and other tax benefits. For example, if you file jointly, you can take tax-saving education credits, the child care tax credit (if you already have children, for example), or you can deduct interest on student loans. Before you do all of this, however, you should definitely talk to a tax professional who can show you the specific figures on your deductions and possible returns and compare filing jointly versus separately so that you can see for yourself how your particular situation plays out. In order to keep your tax information clear, you will need to change your name with the Social Security Administration. You can do this by downloading, filling out, and returning a name change form. Access the form from the Social Security Administration website. These are just a few of the things you should consider doing after you’ve gotten married. The most important thing to keep in mind is that you will need to find out what works best for you and your spouse. Consider finding a tax professional to help you figure out the specifics that will help you get the most out of your tax situation. This guest post is contributed by Raine Parker.